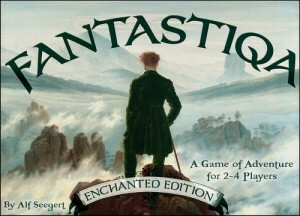 Beautiful artwork, simple gameplay, depth of play, and amazing components make Fantastiqa a real winner. The first thing I noticed when I picked up Fantastiqa was the heft, and the beautiful matte box. There’s nothing especially heavy in the box, but all the pieces and cards are of such a nice stock, and so well made,that combined they weigh a good amount. The core deck building mechanic of the game is very simple. You move around the board defeating various creatures and recruiting them into your deck. Some creatures will give you gems that you can use to buy more creatures, artifacts that give you special powers, or quests, which you need to carry out to earn victory points. The depth of the game comes from paying to get rid of cards you no longer want in your deck, using the special powers of some of your cards, banking cards to use towards quests, and strategically using your limited supply of reshuffle tokens and magic carpets. These two tokens let you reshuffle your discard pile while you still have cards in your draw pile, and warp to any spot on the board for free. There’s even some cards tossed into the mix to really ruin your day. Mischievous Ravens will steal half the gems from the player with the most gems, and Peaceful Dragon cards are useless and just take up space in your hand. The best part of Fantastiqa is how well it plays with younger players. Included in the rulebook is a simplified set of rules for younger players that cuts out some of the depth, but is really easy to teach to kids. My 5 and 7-year-old had no trouble during our first play-through, and have since moved onto the full rules.